Perfect for a quick lunch and appropriate for a light dinner, these Korean- and Thai-inspired tofu wraps offer complex asian flavors and a crispy, crunchy bite. 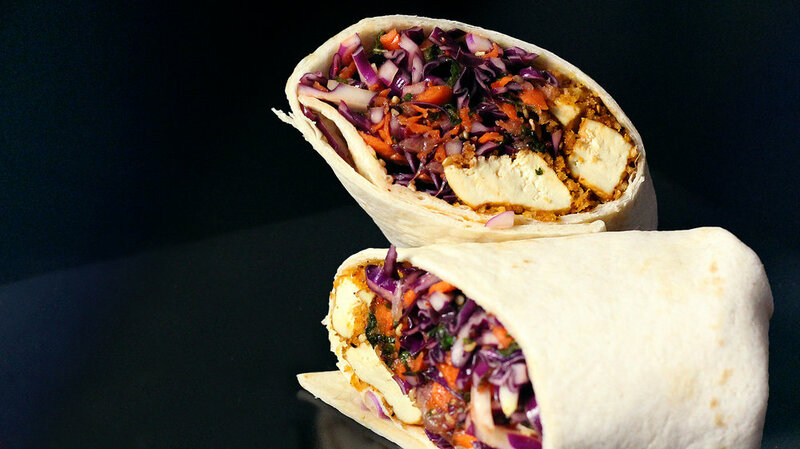 The crispy tofu in this wrap is paired with a korean-style slaw of cabbage, perilla leaves, your classic cocktail of asian sauces (fish sauce, rice vinegar, sesame oil), and some Gochugaru or Korean chili flakes. It's really good, and that's great news because you'll definitely have leftovers. There is so much cabbage in just one small cabbage, you guys. Cabbage definitely has to be the most economical vegetable. Perilla leaf. They're each about the size of your hand (unless you have tiny POTUS hands). Perilla leaves (also known as sesame leaves) remind me of a cross between mint, basil, and tarragon and they'll add an herbal grassiness to the slaw that is quite nice. You can easily find them in any asian grocery store. If you can't find them or you don't want to look, you can just use some mint. Gochugaru should become a staple of your spice drawer/rack. It's fairly inexpensive at asian grocery stores and it's a versatile, not-too-spicy chili that I find myself using more than I thought I would. Definitely pick it up if you don't have it already. This whole dish should come together fairly quickly. For the tofu in this wrap, I used a store-bought Thai BBQ sauce because I have no shame, but also because it saves on time. The tofu is breaded with a variation of the process used to bread the fish in the Tilapia recipe posted on Crisp a few months ago: coat tofu in sauce, bread in a prepared panko breading, bake in the oven. You'll be chomping down on these bad boys in no time.